Confession time: I have a latch checking problem. I grew up on a small hobby farm, and I think any kid raised on a farm naturally becomes a conscientious and aware adult. The #1 rule on a farm is "Always shut gates!" We only had one issue with that my whole childhood, when my brother left the gate open and suddenly we saw Little Red and Festus galloping down the driveway from between the slats in the privacy fence. - Feed Connor a treat, shut and latch door, check latch. 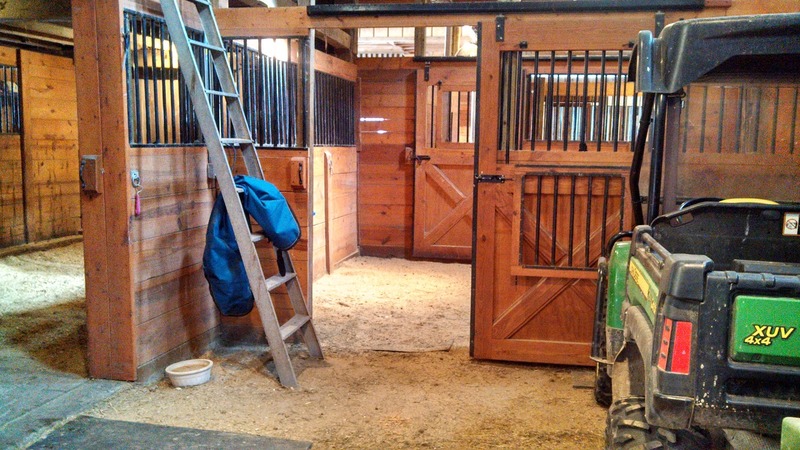 - Check all the other stall latches and waters as I walk through the barn to put my tack away. - In winter, go to the top of the stairs to visually check that the bathroom door is shut so the pipes don't freeze, even if I haven't used the bathroom. There are a lot of doors in my maze of a barn. If I don't do all of those things, or I leave in a rush and can't remember if I did them or not, I WILL turn around. I've gotten five or ten miles away from the barn and turned around and drove back to check stall latches (that have never once failed to be latched...). I can't mentally handle the possibility that I forgot one. But we don't have night check and I've never had a horse escape or run out of water on my watch, so I feel like that neurosis is justified. Anyone else a compulsive latch double and triple checker? I am not a compulsive latch checker (mostly because I have been working in barns so long now it's automatic to make sure that latches are shut!) but I used to board with someone who was. 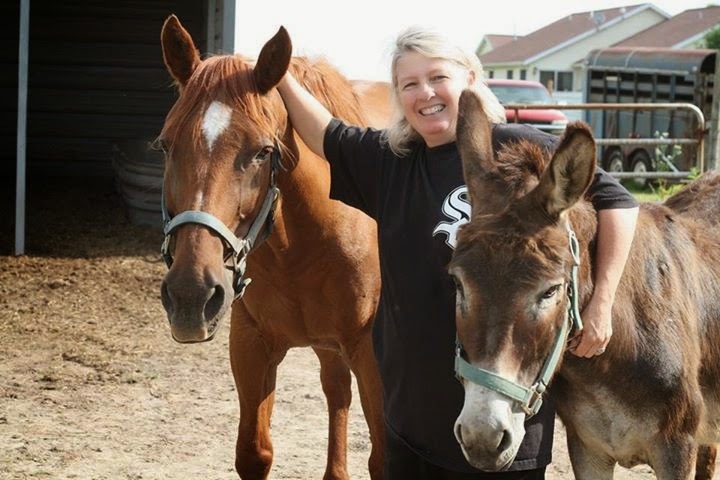 She'd literally check her horse's stall latch upwards of 10 times before she left the barn every day. I keep telling myself it's not OCD because I am not that bad, so thank you! I'm a latch checker, keys in pocket checker, is the front door/car door locked checker, I really have to fight my ocd tendencies. .. YES YES YES. I have driven back to the barn at midnight after I woke up and became convinced I left Tristan's stall door open. I check anywhere from 5-10 times before I can leave the barn. I have developed a little system of standing in front of his door, staring at the latch, and saying to myself "His door is latched." That helps imprint it in my head. For me it's another symptom of some generalized anxiety. I've driven home from work in the middle of the day to make sure I didn't leave the tea kettle on, I've gone home in the middle of my commute multiple times to make sure I closed the front door, etc., etc. Night check helps me a little bit. What doesn't help is that Tristan has Houdini tendencies. He learns the ways doors open and tests them appropriately. He once let himself out of a paddock. You know the kind of gate where you latch it by sliding the chain in the slot? And it's technically pretty snugly closed even if you don't double-latch with a clip? Well, he taught himself to bounce the gate in just the right rhythm to slide the chain out of the slot and would escape. UGH, smart horses! I have done more of those things than I want to admit. :) Glad I am not alone! Night check would be nice, but we don't have it. Smart horses indeed! I do exactly the same thing...despite the fact that I've never gone back and found anything left on, unlatched, etc. I only check the latches twice, but I have a set leaving routine and if I don't follow it I worry that the horses aren't secured in their stalls. In the winter the horse I'm not riding (currently Stampede every single day and sometimes P if he has a day off) gets to walk a few times up and back down the aisle to stretch their legs at night. I always look at the stall latches as I walk along to make sure everyone is secure. I've caught quite a few unlocked doors over the years. Me too, it's amazing, isn't it? Makes me so nervous. Yeah. If I look at it as I latch it, and I'm not, like, distracted and talking to someone, I don't have to recheck. But if I don't, I can't remember if I did or not. Yeah, I always do a visual blanket check too. It's amazing how they can get those straps undone. Not me. None of my horses would EVER play with gate latches and try to escape. Nope. My horse tends to stay put in his stall even when the door is wide open. He has spoiled me. I am spoiled. I also regularly lose my phone, lock my keys in my car, and leave my riding boots at home. Obviously if I had a more escape-prone horse, I'd probably lose him, too. Obviously! Actually the refrigerator door handle of my tack trunk has made a great place to keep my keys while at the barn. Haven't lost them since I put it in. Yes, if I am super vigilant like that I don't need to re-check. I hate that feeling too! I'm the same, to the point where my own place is set up so that if I did forget a stall latch they are only going to get into a sand paddock. If I forgot a gate latch, they'd get into my (safe) yard. It's ridiculous, and part of the reason they are now boarded - I let someone else worry about it lol. I was awful for getting up in the middle of the night to check on them 'just in case'! I know what you mean. Our barn, actually, is set up like that. I like to say I like as many gates between my horses and the road as possible. It's nice. I'm not actually. This may be one of the few areas where I'm not super anxious, lol. I do think being a barn worker intensified it. I don't feel the overwhelming anxiousness as much when it's just my own horse as I do when I'm caring for other peoples' horses. How would I feel if it was my responsibility to care for your horse on Sunday and he escaped and got hit by a car and died? I couldn't live with myself. Your barn is beautiful! Tour?! Please?!!! I actually did that in a post last year! Click here! And of course if you are ever in Indiana, stop by for a tour in person. It's lovely. I have lost my keys at the barn more times than I can count, which is why I implemented a rule that they get hung somewhere I can see them immediately upon walking into the barn. Works well. Yes! Not only do I have to double check that Riva's stall is latched but that a chain is wrapped around it (she can open the latch!) And now that we have Cheers in at night for the winter - yet another latch to double check. Latches not so much, my front door.. yes and I live in a very very safe neighborhood and never lived in a house that was broken into. That's scary too! I've definitely turned around to check that too. What you need is that smartphone app that tells you whether it's open or not, or one that automatically closes on a timer. I want both of those things. UM ABSOLUTELY. I've left doors open twice in my life with disasterous results (colic, wounds) so I will literally turn my car around, be late for work and feel ridiculous afterwards, just to check the latches if I get *a feeling*. Oh my gosh! That's terrifying! I would be a basketcase for the rest of my life about latches. Yep, I'm a compulsive water bucket checker too. That has paid off a few times, we once had a flaky barn worker that would FORGET that! She did not last long at all. I'm not a huge latch checker but the hose is the one that gets me. I turn the water on and wander away...oops! Now I check that it's off multiple times before I leave. Oh yeah, my mom used to do that when we were younger. She left it on all night a couple of times. We were on well water, so it wasn't expensive, but it wasn't good either. We had a river going like 100m away from the trough. It's a way of life, right?! I am super compulsive about tack room, feed room, and gate latches. One theory is, the more times cumulatively that you've done the same simple action, the harder it is to remember any specific time you did the exact same action. Our poor brains can't hold all those (only significant when you forget them) details. I like the first theory! I do think that's true. I try to remember if I've latched it or not when I've left, and I can remember the act of latching it in general, but not any specific details about having latched it that day. But I rely on my compulsive "always leave gates the way you found them" in childhood a lot - it's an automatic thing for me, so most of the time I do actually do it. I'm glad I'm not the only compulsive gate checker out there! I'm definitely OCD about checking gates and doors and will pause a moment at each one to make sure my brain knows that it's latched! As kids, my cousin once left a barn door open & about 20 weiner pigs got out & into the garden. I was grounded from riding my horse for a week (felt like forEVER!) because I didn't check up after my cousin. Lesson learned. I have just started a new blog & would be very pleased if you (and all your readers) would find time stop by & visit. To anyone who likes my blog, I would happily exchange Blogroll links if you would leave your request in a comment! I love the photo entitled 'full alert pony' -- the gorgeous colour streaks in his mane look as though he has just been to a very high end salon! He does have some lovely highlights. Nice to meet you, I will check out your blog! All the time! My husband is constantly annoyed by my "stop the car, I have to check the gates!" as we leave the driveway. Nothing makes a horse person panic more than the words "loose horse". Although my neighbor believes in high quality fencing that resembles dental floss for her two large draft cross geldings. Needless to say, I'm constantly dealing with her fencing and gate latch issues versus my own (knock on wood). Oh boy, that sounds like no fun at all. Loose horses are terrifying!